Appalachia & Beyond: What are those purple boxes for? Parts of East Tennessee have new tree decorations. 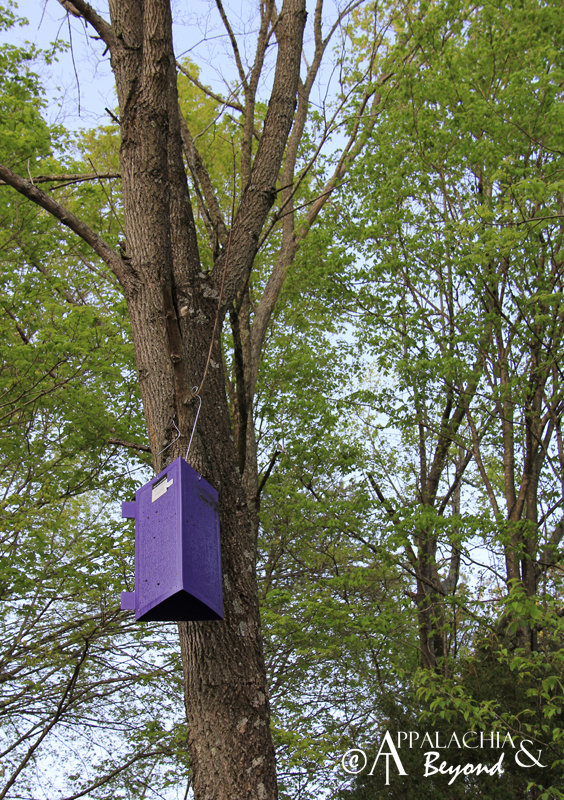 You may have noticed big, purple, triangular boxes hanging from random trees in your area. We've seen them along the highway near our house, and actually seen a truck with the bed full of them out putting them up. It's obvious they're up to catch something; another research project. 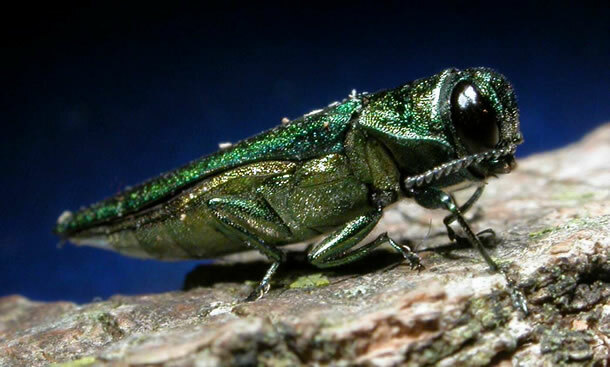 This time, it's the Emerald Ash Borer (EAB), a nonnative beetle responsible for killing tens of millions of ash trees in the Eastern U.S. and Canada, that they're trying to trap in a critical research project aimed at surveying how many of these bugs are infesting our area and what their range is. Tennessee marks the southernmost point - for now - of the EAB migration. It is thought that the beetle probably arrived in the U.S. via wood-packing material from Asia, and has likely been transported south via firewood. This is why it is SO IMPORTANT to buy your firewood locally! The first local sighting occurred last year in an ash tree near the Knox-Loudon county line. And because the little bugger is so invasive, the USDA and the Tennessee Dept. 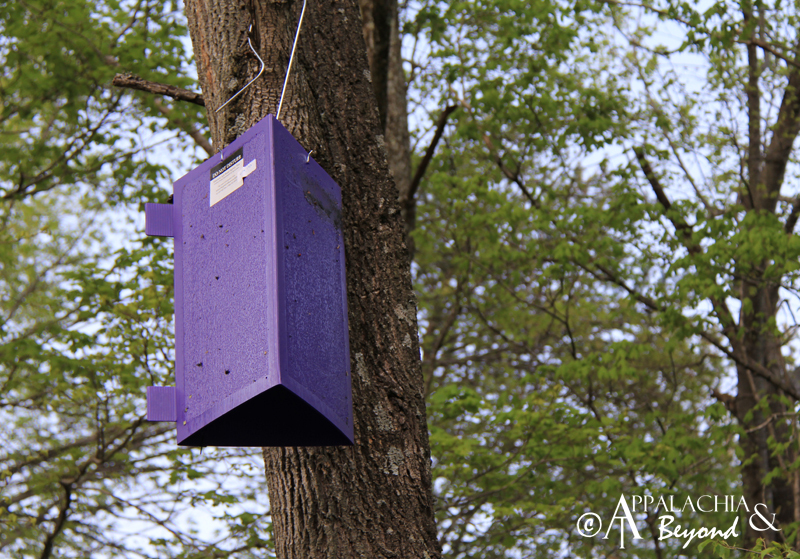 of Agriculture (TDA) have teamed up to place 4,500 purple traps within a 50 mile radius of the first sighting. So, why purple? Apparently the EAB is attracted to objects with a red/purple hue. The traps have a sticky glue-like substance on the outside meant to catch them if they come into contact. Don't worry, it's non-toxic to humans and pets. Officials are asking that you do not disturb the boxes, and that you report any downed boxes to the EAB hotline at 866-322-4512. The traps are scheduled to be taken down in August. We'll try to keep you updated as we find out more information.